Replaces Sony NP-BG1, NPBG1, NPBG1.CE, NP-FG1, NPFG1, NPFG1.CE, Compatible with [Compatible model’s are in the full description below]. Cell will Meet or exceed the manufacturers original OEM specifications. 100% OEM Compatible. Uses lithium-Ion technology to ensure maximum battery life and power. Manufactured using the highest quality materials, CE approved, ROHS Compliant certification. 2 Year Ex-Pro Warranty. Ex-Pro® replacement Li-ion Battery. Can be used as a replacement or additional battery. Our cell’s are manufactured to the highest standard meeting or exceeding the original manufacturers specification and supplied with a 2 year RTB guarantee. Compatible with your original battery and charger, save pounds on OEM manufactures replacement costs. This high-performance battery from Ex-Pro® is comparable quality to the original – and at significantly lower than original manufacture prices. Ex-Pro batteries have low self-discharge and an energy storage capacity for many shots. Our batteries have no memory effect and can therefore be charged whenever you wish (or part charged). 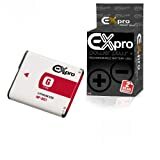 Ex-Pro® batteries have additional protection against short circuits, overload and overheating just like your original but at considerable saving, safety before costs. Ex-Pro® batteries are produced in accordance to EEC and CE approval guidelines, Registered UK Battery producer. This entry was posted in Discount Photography and tagged Battery, Camera, Cybershot, ExPro, High, Lion, Lithium, NPBG1, NPBG1.CE, NPFG1, NPFG1.CE, Plus+, Power, rechargable, Replacement, Sony by Ball Photo. Bookmark the permalink.